“If you want your children to be intelligent, read them fairy tales. If you want them to be more intelligent, read them more fairy tales.” Albert Einstein. So why do we tell them to children? And why do we keep telling them? “Fairy tales do not tell children that dragons exist. Children already know that dragons exist. Fairy tales tell children the dragons can be killed.” G K Chesterton. We use fairy tales for so many different reasons – for a common cultural heritage – even a global cultural heritage as we find many fairy stories twisted and morphed in different versions throughout the world. Mainly, fairy tales teach children to overcome fears. They explain that although bad things can happen to good people, it is how one deals with the bad stuff that matters. There is a great deal of death and violence in fairy stories – the wolf’s burnt bottom in the Three Little Pigs, Sleeping Beauty pricking her finger and lying in a coma – and yet the point of it is to teach children to surmount that adversity. Hansel and Gretel combat the witch using their cunning and wit – they push her into the oven. Fairy stories teach children to make the correct decisions – if Red Riding Hood hadn’t strayed from the path as her mother had warned, she wouldn’t have come across the wolf – if the little pigs had built their houses more strongly, the wolf wouldn’t have puffed them down. If Goldilocks wasn’t set on stealing, then maybe she wouldn’t have been confronted by three bears. Moreover, fairy stories teach critical thinking. Are the characters making the right decisions? Are they being morally upstanding? There is often as much goodness as there is evil, either from unexpected sources (a kind woodcutter) or from unexpected resources inside ourselves – inner strength, intelligence, kindness. The characters are often two dimensional because it is easier for children to identify with them, and the stories are packed with symbolism so that with each retelling of the story the reader or listener can interpret them in different ways. And we do keep reinterpreting them. This is a beautiful new picture book from a debut author that follows Fiona, a small girl dressed in red, to her grandmother’s house. It starts correctly – ‘Once upon a time’, but this is a twist on the traditional Red Riding Hood story. On the way she encounters a giant, a troll, and a dragon, but although they appear scary, they are actually all in distress in one way or another, and Fiona helps them out. Then when the wolf nabs her basket, her new friends retrieve it for her – one good turn deserves another. They end up at Grandmother’s house – all together enjoying tea – and it turns out that Fiona’s grandmother is a friendly witch with a green face. The magic lies in the setting. 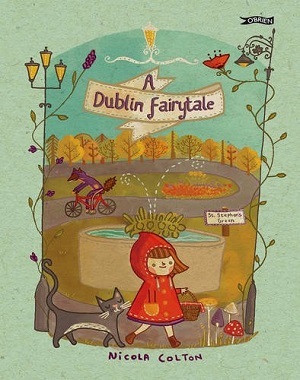 Fiona sets off with a map in hand, and each encounter with a fairy tale creature is set in a real place in Dublin –the book traces the city through illustrations. The characters exude warmth, as does the book, which boasts tones of oranges and greens. It’s quite a unique illustrative style, old-fashioned almost, and hugely appealing to children, with easy shapes, interesting patterns, and beautiful detail on the buildings. A lovely addition to the fairy tale picture book canon. You can purchase from Waterstones here. The beautifully produced hardback version – with gold leaves and gold embossed title, a red spine and sumptuous cloth feel – gives an immediate suggestion that this book is fit for a king. 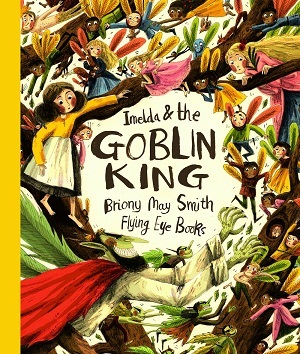 The illustrations continue the theme – sumptuous colour and exquisite detail with old fashioned depictions of fairy creatures – elves and pixies with pointed ears, leafy wings, toadstools and garlanded heads. It is highly reminiscent of the flower fairies range. It tells the story of Imelda, who ventures into an enchanted wood, populated by fairy folk. The Goblin King is a huge bully who arrives and locks up the Fairy Queen when things don’t suit him. Imelda plots for his comeuppance, and succeeds in ridding the forest of the bully – in fact he is turned into a worm! The illustrations are what bring this story to life – each page is an adventure in itself, every fairy, pixie and elf seems to have its own distinct personality – the wings look like leaves, the flowers droop or bloom depending on mood, and the food looks stunningly sumptuous. There is exquisite detail, lovely use of speech bubbles, and humour as well. And of course, the moral of sharing and being friendly. A beautiful book that would make a great gift. Purchase here.